Lowndes County is going to pave Coppage Road from Skipper Bridge to ValDel. I wanted to remember what it was like before it got paved so I took this video. This entry was posted in Canopy Road, Development and tagged Canopy road, Coppage Road, Gretchen Quarterman, Hahira, John S. Quarterman, Lowndes County on December 15, 2015 by Gretchen Quarterman. Here’s his church website with additional information: Newsome Street Church of Christ in Hahira. This entry was posted in Gardening, Okra Paradise Farms, SOGALO14 and tagged Eugene C. Godfrey, Eugene Godfrey, Gardening, Gene Godfrey, Georgia, Hahira, Lowndes County, Lowndes County Partnership for Health, Minister, Newsome Street Church of Christ, SOGALO14 on January 17, 2014 by John S. Quarterman. 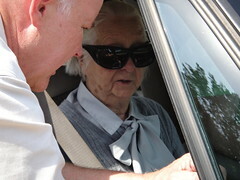 Aunt Elsie still lives in her own house in Nashville, connected to her nephew Patrick’s house, where Patrick and his wife Ann live and take care of her. This entry was posted in Botany, Cedar glade, Elsie, Plants and tagged 28 November 2012, Ann Quarterman, Botany, Caithness, Cedar glade, Columbus, coneflower, Duke, Duke University, Echinacea tennesseensis, Elsie, Elsie Quarterman, Georgia, Gretchen Quarterman, Hahira, John S. Quarterman, Lake Park, Lowndes County, Lyons, Midlothian, Morven, Nashville, Naylor, Patrick Quarterman, plant ecology, Plants, Roslin Castle, Roslynn, Scotland, Sinclair, Skye, Tennessee, Thurso, Valdosta, Vanderbilt on November 28, 2012 by John S. Quarterman. This entry was posted in Botany, Elsie, History, Plants and tagged Cedar glade, centenarian, Echinacea tennesseensis, Ecology, Elsie Quarterman, endangered species, Georgia, Hahira, Lowndes County, Nashville, Nature Conservancy, plant, Tennessee, Tennessee Coneflower, Valdosta on November 11, 2011 by John S. Quarterman. The U.S. Fish and Wildlife Service plans to officially remove the wildflower by Sept. 2, from its list of plants that are near extinction. “The Tennessee coneflower’s recovery is an example of what can be achieved through the combined efforts of dedicated partners,” said Cindy Dohner, the Service’s Southeast Regional Director, in an emailed announcement. Echinacea tennesseensis was thought extinct until Dr. Elsie Quarterman rediscovered it in 1969 in the cedar glades which are her academic specialty. She was 59 then. 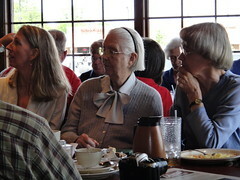 Now she is 100, and still being honored by her students and by her state. Aunt Elsie was born in Valdosta and played basketball for Hahira High School, before she started her very long career in botany and plant ecology. PS: This post owed to Patrick Quarterman. This entry was posted in Botany, Cedar glade, Elsie, Plants and tagged Cedar glade, centenarian, Echinacea tennesseensis, Ecology, Elsie Quarterman, endangered species, Georgia, Hahira, Lowndes County, Nashville, plant, Tennessee, Tennessee Coneflower, Valdosta on August 4, 2011 by John S. Quarterman. 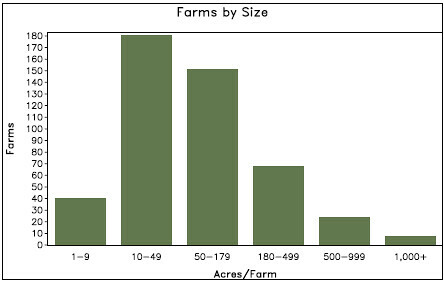 In Lowndes County, Georgia, the number of farms increased by 2 and the size of farms decreased, according to the USDA 2007 Census of Agriculture. Farms in Lowndes county are mostly small, averaging 145 acres, with the largest category being 10-50 acres. Of course, that’s slightly misleading since so many small farms are rented by a few larger operators, some based in other counties. Still, small farms are the easiest to wean off the pesticide teat. Given that the average age of principal farm operator in Lowndes County is 57.9, something is likely to change soon as many of those operators retire. We already know that local farming is linking up with local markets through Hahira’s summer farmers market, which has been going on for years, increased farmers markets, and through the new Downtown Valdosta Farm Days. That looks like a good direction. This entry was posted in Agriculture, Agrochemicals and tagged Agriculture, census, farm, farmers market, Georgia, Hahira, local, Lowndes County, small, USDA, Valdosta on May 29, 2011 by John S. Quarterman. 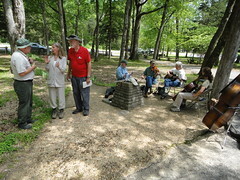 There were classes, botany walks, owl hoots, and musicians. Here’s the schedule. It was sunny this year, unlike last year’s great flood. Next year, you should come! Get out of town, take a walk in the glades. 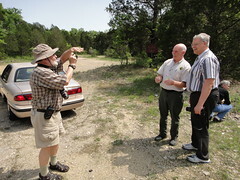 Elsie got a guided tour, with Tennessee State Naturalist Emeritus Mack Pritchard and his successor Randy Hedgepath. Here they are with Elsie’s nephew Patrick Quarterman, while Gretchen Quarterman photographs a glade. This entry was posted in Cedar glade, Elsie, Plants, Science and tagged Ann Quarterman, biology, Botany, Buddy Ingram, Carol Baskin, Cedar glade, Cedar Glade Wildflower Festival, Cedars of Lebanon, centenarian, Echinacea tennesseensis, Ecology, Edna Winn Small, Elsie Quarterman, Elsie Quarterman Cedar Glade, Georgia, Hahira, Jerry Baskin, Kim Cleary Sadler, Lebanon, Lowndes County, Mack Pritchard, Middle Tennessee State University, MTSU, Nashville, Patrick Quarterman, Plants, Randy Hedgepath, Tennessee, Tennessee Coneflower, Thomas Ellsworth, University of Kentucky, Vanderbilt on May 1, 2011 by John S. Quarterman. You find local and organic food without pesticides in Lowndes County. They also said that consumers should thoroughly wash fruits and vegetables; go beyond a quick rinse and use a soft brush, if practical. Consumers could also consider buying organic produce when possible as a way to reduce pesticide exposure from food, they said. Fortunately, you can buy local and organic food around here, at Fiveash Grocery in Hahira and at Whisk in Valdosta. Hahira has a summer Farmer’s Market every Saturday in June and July. Valdosta’s new Farm Days start May 7th. There’s even an online farmer’s market. Ask the farmers what pesticides they use. You can even buy organic at Publix. So there is local and organic food in Lowndes County and area. This entry was posted in Agriculture, Agrochemicals, Food and Drink, Glyphosate, Health and tagged farm days, farmers market, Fiveash Grocery, Food, Georgia, Hahira, local, Lowndes County, organic, Publix, Valdosta, Whisk on April 26, 2011 by John S. Quarterman. This entry was posted in Music and tagged air, Georgia, Hahira, jazz, Lizz Wright, Lowndes County, trouble, wind on January 26, 2011 by John S. Quarterman.